The third week of March may be a time for celebration for many reasons. Those not enjoying a relatively extensive festival of national culture may instead feel the need to mark the results of certain marquee sporting events. If you chose to celebrate “St. Patrick’s” weekend with a few drinks, we here at ES hope you enjoyed the use of moderation as well. Recent research suggests that consuming alcohol in large amounts is not conducive to ideal health – even if it’s done in one-off bursts as rare events. A study, presented at the European Society of Cardiology’s symposium held yesterday (18 March 2018) in Barcelona, appears to demonstrate that an increased level of alcohol consumption was associated with increased heart rates in its participants. Scientists have been saying that alcohol consumption, affects cardiac function since the 1970s. However, the evidence to corroborate these claims has come from anecdotal sources or small-scale studies. A much more extensive, large-scale project on the subject might give the theory more weight. An example of such a study is the Munich Beer Related Electrocardiogram Workup (MunichBREW) undertaking. This project was actually conducted at the 2015 Oktoberfest, in which over 3000 volunteers agreed to have their cardiac functions assessed in conjunction with their participation in the event. The volunteers agreed to donate the readings from electrocardiography (ECG) and breath alcohol concentration (BAC) tests. In addition, the researchers behind MunichBREW also analysed data from the Co-operative Health Research in the Region of Augsburg (or KORA S4) Study from over 4000 participants who consumed alcohol regularly. This was done to assess any differences in heart function between ‘acute’ alcohol use and chronic alcohol use. 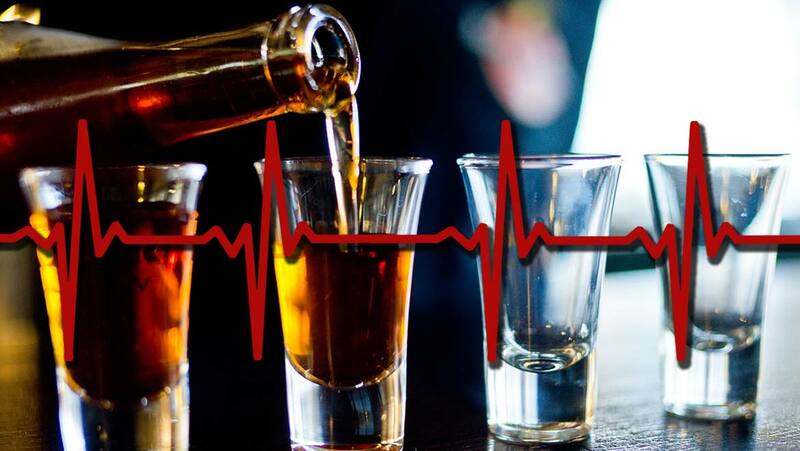 The researchers found that sinus tachycardia, a form of heartbeat anomaly, was significantly associated with alcohol consumption in both studies. The concentrations indicated by the BAC tests were also significantly associated with cardiac arrhythmia in the MunichBREW participants. The odds-ratio for the risk of arrhythmia was 1.75 with a confidence interval (CI; 95%) of 1.50 to 2.05. This ratio was 1.96 (1.66-2.31 95%CI) for sinus tachycardia. Therefore, the risk and incidence of these abnormal heart rate types were likely to be increased as a result of alcohol consumption. Sinus tachycardia can increase beats per minute to about 100, whereas arrhythmia can disrupt the normal frequency of heartbeats. Either condition may be a risk factor for cardiovascular disease types. For example, it may influence the tendency to develop atrial fibrillation, a more severe form of irregular heartbeat. In addition, the researchers found that the tone of muscles that control basic automatic functions (such as the lung function involved in breathing) was also reduced by alcohol consumption. On the other hand, they also recorded other indicators of these autonomic functions, such as QT interval and QRS complexes, were not affected by BAC readings. Therefore, the effect of alcohol on cardiac health may be more complicated than previously thought. On the other hand, the volunteers in the MunichBREW study were relatively young and healthy. They had an average age of about 35 (albeit with a large standard deviation of just over 13 years) and 70% of them were male. Therefore, it is less than ideal to use this study to base far-reaching conclusions on the role of alcohol consumption on long-term cardiovascular health. This will require continued work in a similar vein, which the researchers behind this project plan to move on to next. These scientists were affiliated with the German Cardiovascular Research Centre in Munich; the German Research Center for Environmental Health in Neuherberg; and the Ludwig-Maximilian University in Munich. However, Dr Stefan Brunner, the lead author of the study, feels comfortable in making the statement that alcohol use leads to an increased heart rate. Accordingly, the effects of chronic alcohol use and abuse should also be studied in the context of cardiac functions. The actual mean blood-alcohol concentration of the participants in MunichBREW was 0.85g of alcohol per kilogram of bodyweight, whereas the average total consumption recorded in the KORA S4 study was 15.8 ± 21.4 grams per day. Therefore, future studies in this area may have to involve a standardised definition of chronic, excessive or abusive levels of consumption for an accurate assessment of alcohol’s effect on heart health. The results of this study may also substantiate other population-level projects that have found a link between the concentration of alcohol consumed and acute atrial fibrillation. It may have also demonstrated that alcohol use can affect autonomic functions, heart rate and the regularity of the same. These may contribute to the risk of atrial fibrillation, which may in turn increase the risk of serious events such as stroke and heart failure. All in all, enjoying alcohol in moderation is looking like better and better advice as the relevant science progresses. Brunner S, Herbel R, Drobesch C, Peters A, Massberg S, Kääb S, et al. Alcohol consumption, sinus tachycardia, and cardiac arrhythmias at the Munich Octoberfest: results from the Munich Beer Related Electrocardiogram Workup Study (MunichBREW). European Heart Journal. 2017;38(27):2100-6. The End Of The Internet As We Know It…Could It Happen?